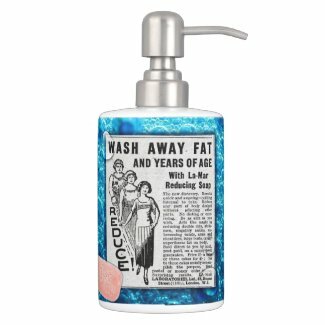 Wouldn’t it be great if we could wash away fat? And “years of age” as well? But this soap would only work if we used it jumping around an Aqua Fitness class. This vintage ad for La-Mar Reducing soap ran in a London paper. I freshened it up in Photoshop. Ladies, if you want to come down the staircase slimmer like the woman pictured, you going to have to hit the gym before you hit the tub with the fancy soap. I love the money-back guarantee. I wonder how many buyers sent back their soap. I put this design on a soap dispenser set on Zazzle. The soap dispenser comes as a set with a toothbrush holder, so I put a vintage ad for dental powder on the back.